To even the most casual Orlando TV news watcher, this will come as no surprise: Search engine Bing on Tuesday listed the top searches for 2011 — and Orlando’s own Casey Anthony topped the list as the most searched news term. 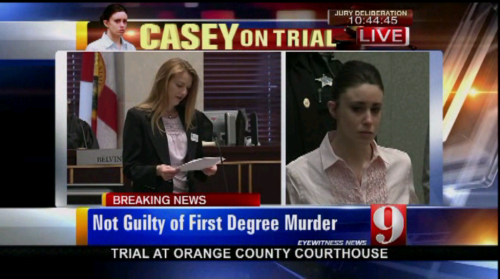 The Casey Anthony-Caylee Anthony saga played out over several years on Orlando TV news, culminating this summer with the jury verdict that found the mother not guilty of her young daughter’s death. As you recall, Orlando stations saw huge viewership surges with their extended coverage during the trial, with all the area stations eventually breaking down and carrying it gavel-to-gavel each day. WKMG even started bumping CBS primetime shows to air trial specials. Even today, if you do a search on “Casey Anthony trial” on Google, WFTV.com still ranks high — just behind market web leader OrlandoSentinel.com. By the way, behind “Casey Anthony trial” as the top news search team of 2011 was “Osama Bin Laden death” at No. 2 followed by “Hurricane Irene” at No. 3. Incredible.